You would expect the holder of the title “director of strategic communications and English-language spokesman” to talk about how to woo The New York Times or how to convince the BBC for positive write-ups about Palestine. But while Jamal Dajani — appointed Jan. 26 as new media guru for Palestine's prime minister — is deeply interested in how the Palestinian narrative is reflected internationally, his first priority is working with the local media. For him, the first task in representing a politician is to communicate with the local constituency. 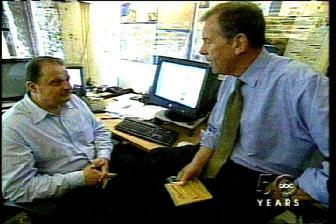 GESTURING forcefully in his cluttered office, Jamal Dajani looks and sounds more like an old-school Chicago newspaperman than his somewhat loftytitle might suggest: director of MiddleEastern programming at Link TV, thenonprofit, 24-hour channel that brings satellite news from around the world to American households. not very ample spare time Mr. Dajani and his Israeli-born production partner, David Michaelis -- along with six editors who double as translators -- produce a weekly commentary program, �Mosaic Intelligence Report,�� in which Mr. Dajani offers his views, based on reporting, about topics like the progress of the Israeli-Palestinian talks. �We�re trying to give people here a window on what 300 million people in 22 countries are seeing on a daily basis,�� said Mr. Dajani, who starts monitoring broadcasts at 4 every morning at home then comes into the office here to pull each day�s show together. NEWS PRODUCER JAMAL DAJANI recently spent time in the Arab world watching the Middle East watch television. A Jerusalem-born Palestinian who has lived in America the past 27 years, he wanted to touch base with his native land to get a better read on the much-heralded satellite TV revolution. Everywhere he looked, the populace was tuned in to programming from around the world�not just from the region. More..
David Michaelis and Jamal Dajani talk about growing up in Jerusalem and the prospects for peace in their homeland. What memories do you have of growing up in Jerusalem? And how deep are your connections to the city? Jamal Dajani: My family lived in Jerusalem for centuries. In 1948, the state of Israel was founded, and for Palestinians, this time was called the Nakba, or the "catastrophe." Like many Palestinians, my father and his whole family were pushed out of their ancestral home. They moved to a small apartment in East Jerusalem because the city was divided into a Jewish and Arab city. And then in 1967, the Six-Day War happened, when the Israelis invaded Jerusalem and conquered it. My childhood memories are divided between what happened before 1967 and what happened after. Before the war, a wall separated Arab and Jewish Jerusalem, and I only knew what existed beyond that wall through the stories my father told me. I grew up knowing a united Jerusalem, but I also lived under an Israeli occupation, where we always longed to go back to our ancestral home. Today, the Israelis who tore down the wall in 1967 are building larger and uglier walls. Jerusalem's beautiful hills and suburbs are turning into ghettos. Jamal Dajani never dreamed that he would become a television producer. A Palestinian-American and former president of the Arab Cultural and Community Center in San Francisco, his true passion had always been political science � his major at Columbia University. Shortly after Sept. 11, however, everything changed. It was then that he got a call asking if he would like to help start up a daily news program on San Francisco-based satellite network Link TV to better connect American viewers with current events in the Middle East. Although he had never worked in television before, Dajani recalls that he knew that he had been given the opportunity to do something �new and important,� and he leapt at the chance. These days, he spends a lot of his time in a windowless room lined with glowing television screens, accompanied by a small but dedicated production staff. Their show, called Mosaic, pieces together translated � but otherwise unedited � news stories that come directly from networks throughout the Middle East, including Abu Dhabi TV, Cairo�s Nile TV, Qatar�s Al Jazeera, and the Israeli Broadcast Authority. Where do you get your news? Do you rely on only one or two TV networks or national newspapers to tell you what�s happening in the world? If so, you are not tapping into one of our most valuable natural resources: information. And unlike our other natural resources, the more you consume of this one, the better it is for the rest of the planet. The more information you have, the more responsible you can be as a global citizen. And like it or not, we are all global citizens now, living in a world where our actions can affect people in distant lands, whether it�s driving a vehicle that contributes to global warming or calling our congressional representatives to urge them to push for nuclear disarmament. How can we make educated decisions and act responsibly if we accept the version of reality presented by only one news source? Jamal Dajani, a Palestinian American who was raised in Jerusalem, is director of Middle East programming at WorldLink TV, a satellite channel based in San Francisco. Dajani, 45, produces WorldLink's "Mosaic" program, which rebroadcasts -- with English translations -- news programs from the Arab world. Jamal Dajani spends most of his time watching TV. As the Director of Middle Eastern programming at Link TV, and winner of the prestigious Peabody Award, he is responsible for shows that reach up to 27 million satellite TV subscribers in the United States. Upon graduation, Dajani was an entrepreneur for 20 years. His business ventures spanned real estate, manufacturing and hospitality. He moved to San Francisco in October 1988.